Talbot Rothwell offered Peter Rogers a script called Follow That Cab and this was just at the same time that Norman Hudis was deciding to leave these shores for the United States. It was not intended as a Carry On but its storyline and characters were so similar to the Carry On style that it was released as Carry On Cabby and became a turning point for the films. 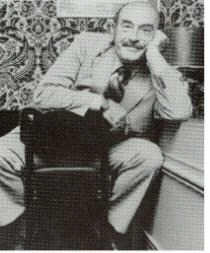 Tolly, as he was called by his friends, was already an established scriptwriter when he fell in with the Carry On team. He had scripted for the Crazy Gang and had written radio and TV shows for Terry Thomas, Arthur Askey and Ted Ray. He has also had success with stage plays, namely Queen Elizabeth Slept Here, Once Upon A Crime and Meet The Wife. According to a profile of himself he did once, "Rothwell, was born at an early age to mixed parentage, one father, one mother", on the 12th November 1916 in Bromley, Kent. He claims to have dropped his first ghastly pun at the age of 9 when after a disasterous newt-fishing trip, he commented, "No newts, is good newts!" His early life in the '30's as successively a clerk at Brighton Town Hall, a member of the Palestine Police Force and an RAF pilot gave little indication of any showbiz potential. It was during WWII, when he was forced to jump plane over German-occupied Norway, and spent several years in a German prisoner-of-war camp and it was there that he became interested in entertainment. He wrote, MC'd and performed for the camp theatre, and at one time organised a raucous show to mask the noises made by escapers. Fellow prison camp entertainers including Rupert Davies, who later became TV's Maigret and Carry On's Peter Butterworth. He wrote 20 of the 31 Carry On films. Rothwell wasn't a writer of carefully sewn up plot lines. His narratives were as unbridled and anarchic as his sense of humour. He had seen a great many of the Music Hall comics and was a great admirer of Max Miller, whose risque routines were legendary. Rothwell saw the Carry On series as a continuation of the Music Hall that the younger generations never enjoyed. He concentrated much of his writing energies on those corny double entendres and mind-boggling puns. In Hudis' films the risque jokes were no more than a decoration but in Rothwell's scripts they became the very fabric of the films. We have examples of this in Matron. Hattie Jacques as Matron tells Dr Cutting (Kenneth Williams), "I'm a simple woman with simple tastes. I want to be wooed". To which Williams replies, "You can be as wude as you like with me!" Rothwell also had a skill with daft names. We have The Khasi Of Kalabar, Citizen Bidet, Senna Pod, Emmannuelle Prevert and Jock Strapp to name but a few, which adds to the overall fun of the series. "By this time tomorrow," says Citizen Camembert, standing gleefully by the guillotine in Don't Lose Your Head, "the Duc Of Pomfrit will have had his chips!" and you wonder if the Duc Of Pomfrit was called this, just to make this joke work. After the French puns, there were inspirational Latin ones too. In Cleo we have the slave sellers Markus and Spencius, and who else but Rothwell would think of calling a street Avery Avenue for no other reason than giving Sergeant Bung the line in Screaming, "Then we must explore Avery Avenue". It was Rothwell who was responsible for the introduction of another Carry On tradition, the secondary titles, like Mind My Chopper - Henry, or Womb At The Top - Matron. His jokes were bawdy but never really dirty and they could always be taken innocently, "I have what you might call self-imposed rules. Nobody ever actually swears and nobody actually succeeds in getting in to bed with anyone else." After Rothwell's untimely death in, the next three films, Behind, England and Emmannuelle caught up with the permissive society and became a great deal more explicit - to its detriment. He died on February 28, 1981 (age 64) in Worthing, Sussex, England.